Late March and the rain has finally given up for at least a day and the early morning spring sunshine promises a beautiful day. 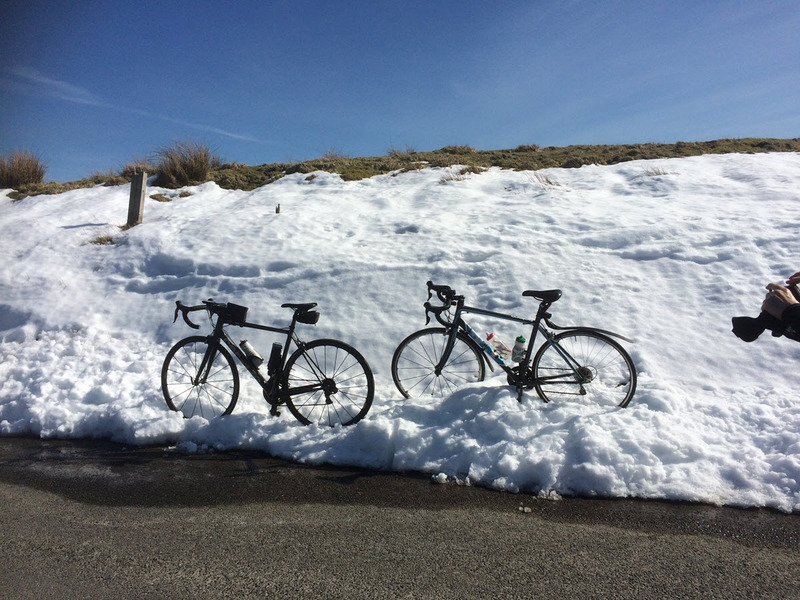 My MAMIL (middle aged men in lycra) friends and their female accomplice suggest we head for the hills on our two wheeled friends and make the best of, what appears to be, the first real day of spring. 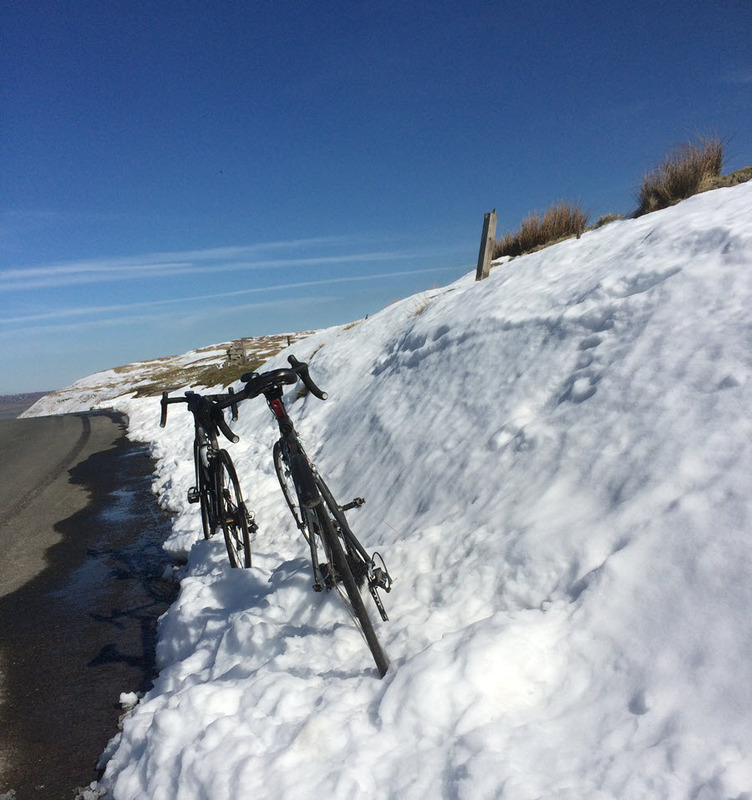 Perhaps the winter has been a long one, or my memories of weary legs a little too distant. Either way I naively, and even eagerly, agree. The route has been decided and I am assured that it will be a steady day with plenty of stops for cake and coffee. Foolishly, I buy these tales. 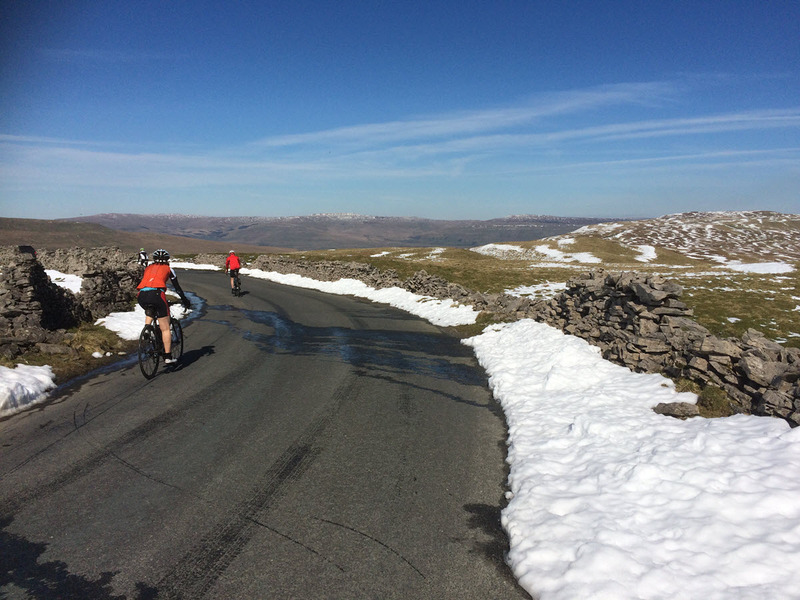 We meet near Kettlewell and set off on our sleek road bikes, shorts and legs making an outing for the first time in many months. There are five of us in our little party. With three of the group over-sixty and one rapidly approaching his sixth decade, I, at 53, am the spring chicken of the group. Sadly, this means little and only adds to my humiliation of being tail-end-Charlie for the duration of the ride and as the trip progresses the tail endishness becomes much more apparent. The route is beautiful and I highly recommend it to fellow cyclists, walkers or those preferring the more sensible four-wheeled option. From the bustling village of Kettlewell we head towards Hawes via the steady but relentless climb of Fleet Moss. My friends accelerate with apparent ease and are rapidly a small and diminishing speck on the horizon. At least the passing traffic has little trouble getting past a lone cyclist, especially one that is crawling at a sad snail pace. Cyclists and motorists seem to be increasingly at odds but on this particular day I think this lady in lycra generated more sympathy than anger. Fleet Moss was worth the climb. 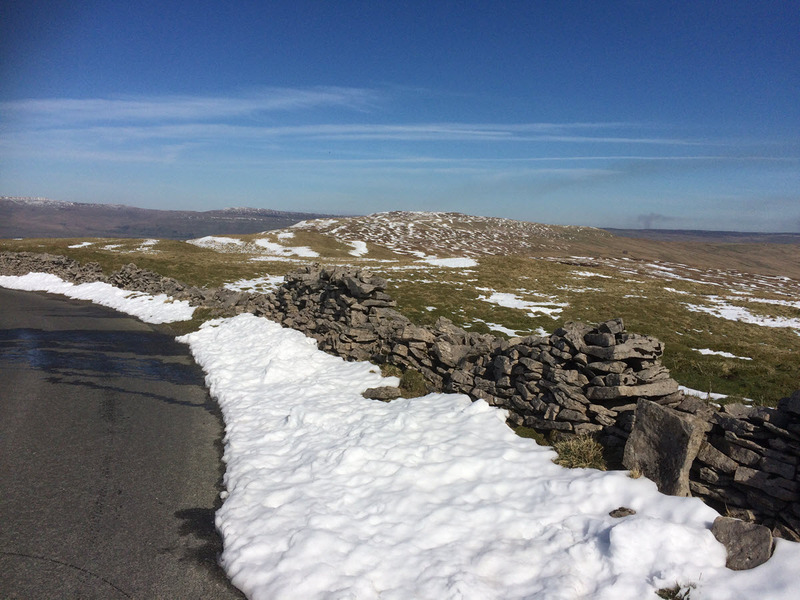 The views into Wensleydale are stunning and the snow at the side of the road and clinging to the hillsides reminds us that it’s still chilly up North and not to get ahead of ourselves thinking that summer may be round the corner. Tail end Charlie reunited ,we are rewarded with a magnificent descent into Hawes where we indulge in scones that struggle to fit on the plate and copious amounts of caffeine to assist us with the next part of the journey. It takes more than a scone to power me up the next, almost vertical, challenge. Dent is our next port of call but the direct route is far too easy an option for my age defying pals. Rather than sticking to the valley road, which follows the babbling river gently into Dent, we take a sharp right and head up the infamous Col Road. Billed by my pals as ‘the hill of the ride’, this certainly isn’t for the faint hearted. Once again they find that secret gear in their legs that seems to elude me and I settle into my allotted place as rear guard, huffing and puffing my way up the never ending climb. 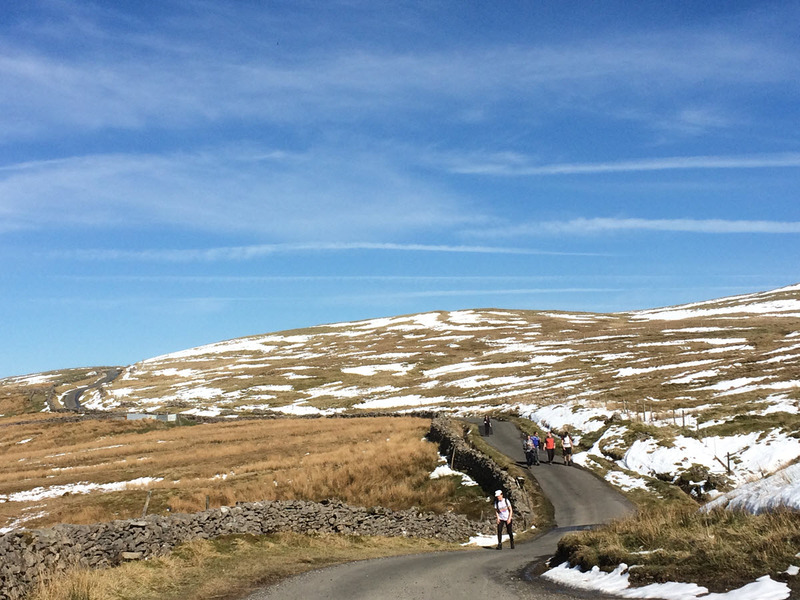 Thankfully, the sun continues to shine, the wind is barely a whisper and the views remind me of why I love living in the Dales – once I can see them through my sweat-steamed glasses. The descent down to the valley road takes us past Dent Station. I wonder how many people have innocently taken the train to Dent, only to find, as the train disappears, that they are ¾ of a mile above Dent. Beware if you ever explore the Dales by train. Someone should rename the station – ‘quite a long way up the hill from Dent’. 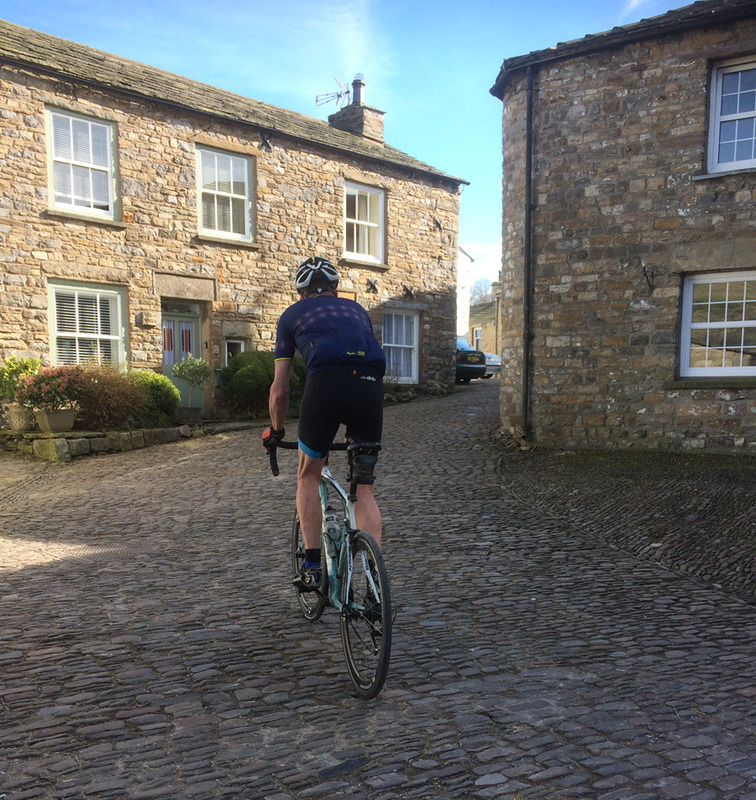 We bump over the cobbled streets into the pretty village of Dent and refuel with cyclists’ favourite fodder of beans on toast and more caffeine. By now my legs know that they are on a big day out and are already thinking it’s time to stop going round in circles and be rewarded by a hot bath. Unfortunately, we are not even half way and more climbing awaits. The beans and coffee have their work cut out. We head in a homewards direction, keeping to the back roads that lead us to Newby Head. The roads are almost traffic free and for, at least a few miles,the ride is relatively gentle. Predictably, the easy riding is short lived and we head upwards, past the viaduct to Newby Head, another well-known climb, which I perform at an even slower rate. The peace and quiet is shattered as we join the road to Ribblehead. This is the playground for the motorised two wheelers who whizz past us at terrifying speeds, enjoying the dry roads and sunshine. They seem to hit impossible speeds and make the downhill journey towards the Yorkshire three peaks more than a little onerous. Ribblehead is throng with walkers and cars, all out to make the best of the perfect spring day. We head towards Horton and are blessed with beautiful views of all three magnificent peaks, still clad in a smattering of snow which grants them even more splendour than usual. Whilst we are allowed a pit stop at the public loos, another coffee stop is not an option as there are fears that tail-end Charlie’s up hill speed may mean that we do not get back in day light. From Horton we follow the road to Stainforth where our last ‘proper climb’ awaits. By now my legs are mostly jelly and practically whimper at the thought of yet more ‘up’. The rest of the group look positively fresh, despite the previous 52 miles, and breeze up the winding hill that takes us back towards Wharfedale. From somewhere I put the last of those baked beans into action and make it to the top, helped by a gentle tail wind and the promise of more stunning views and a journey along my favourite road in Yorkshire, and possibly, the world. If you do happen to visit Malahmdale or Wharfedale don’t miss this gem. 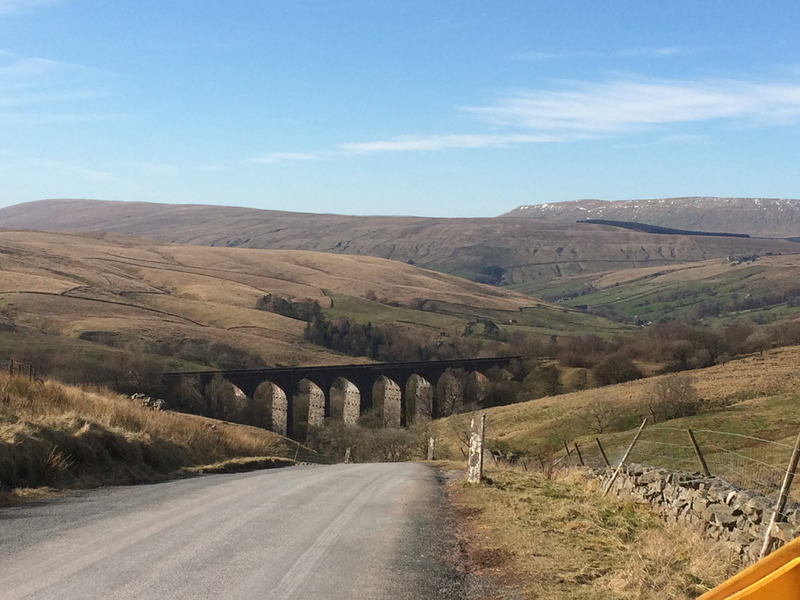 The road from Malham or Stainforth to Halton Gill is awe inspiring in my humble opinion. With Penyhghent to the left, Fountain’s Fell to the right, the hills of Settle in the background and a panoramic view of Wharfedale ahead it always makes my heart stop just a little and brings a smile to my face, no matter how hard the journey has been. Today the Lapwings are busy getting ready for spring. There is a certain section of the route that seems to be their summer home and in a month or so they will be berating passing humans on the off chance that one should disturb their young. Today they make it clear that this is their home and swoop back and forth as if readying themselves for new beginnings. 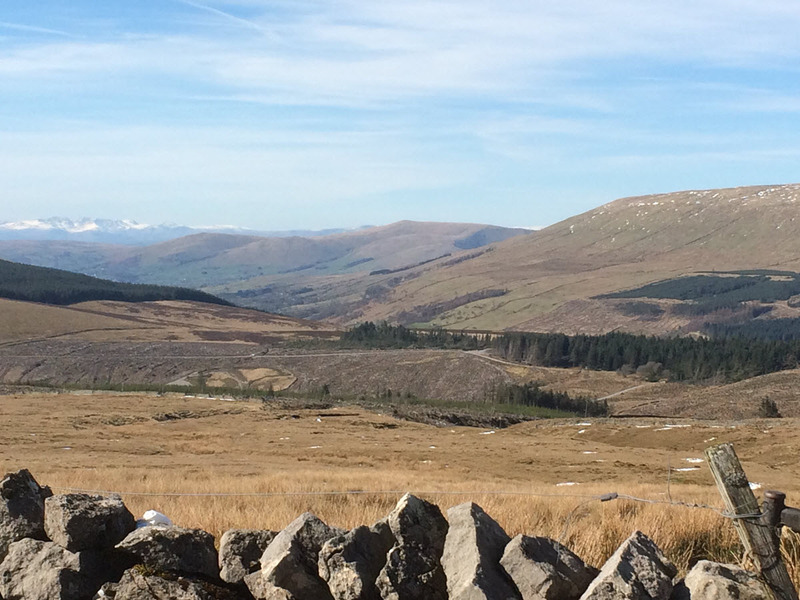 A little further on, three Oyster Catchers huddle together chattering loudly, looking across to Fountain’s Fell. They seem engrossed as if sharing the latest, most important, piece of news. As we climb to the top of the Halton Gill road a lone Curlew glides above me. Weary though I am, I am filled with a certain spirituality that seems to belong to this place. All is quiet. The sheep look a little matronly but lambing is weeks away for these upland ewes, and they graze contentedly enjoying the sun on their backs. Legs, almost at exhaustion level, happy in the knowledge that home is round the corner, enjoy the car free descent into the hamlet of Halton Gill and we follow the valley back towards Kettlewell. Not everyone is out enjoying themselves on this beautiful Saturday. We pull in to greet Brenda and her partner who take an annual two-week ‘holiday’ from nursing to come and lamb 200 ewes. With only one occupant in their so-called, HDU pen they seem happy with progress and particularly happy that the weather has taken a turn for the better and they no longer have to squeeze new and expectant mums into any cover that can be found. The field next to their barn is gradually filling with wobbly new-borns and proud, protective mums. The ride back to Kettlewell is the perfect finish to a lovely day. Even tail-end-Charlie manages to cling to the back of the group, spurred on by the prospect of a cup of tea and a hot bath. A magnificent ride, a great drive in a car, I can highly recommend it, just make sure that your friends are at the very least double your age and don’t have an extra gear stashed away somewhere or have been on a secret training camp.